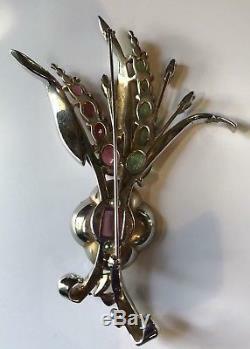 This vintage gold wash sterling silver or non precious metal rhinestone and shades of green and pink faceted glass bouquet like pin is signed MAZER. Measures approximately 4" by 2-3/4" and weighs 34.4 grams. Very nice condition with some signs of wear from use. 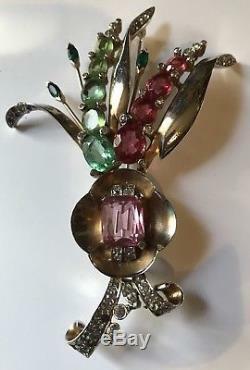 The item "MAZER LARGE VINTAGE RHINESTONE FACETED PINK & GREEN GLASS RETRO PIN BROOCH" is in sale since Saturday, November 25, 2017. This item is in the category "Jewelry & Watches\Vintage & Antique Jewelry\Costume\Designer, Signed\Bracelets".